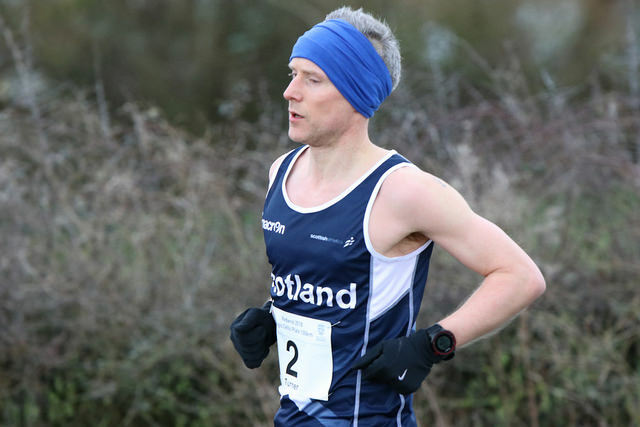 The next step on this journey to Comrades Ultra Marathon (Comrades) was the small matter of a call up to the Scotland 100km team that would compete in the annual Anglo Celtic Plate incorporating the British 100km Championships. I was part of a strong Scotland team including last year’s Scottish 100km Champion David McLure, 2017 West Highland Way 3rd place, Dave Ward and former Barry 40 winner Grant Jeans. We were a good team, but we would need to perform well to bring the ACP back to Scotland. 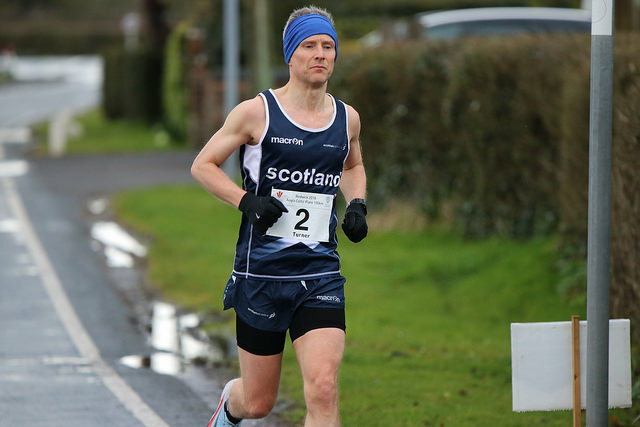 England had brought another solid team with UK 100km silver medalist Anthony Clark, Jez Bragg, who needs no introduction, stalwart Nathan Montague and newbie Michael Stocks who was runner up in a solid time at the Gloucester 50k in January. The Welsh team were missing a couple of their key strong members but managed to still bring a good team to the party. Redwick was the small village in South East Wales where the race would take place. A roughly 2 mile loop of country roads that we would run 31 times (plus a little extra) to complete the 100 kilometres. When we arrived at 7:30am there was no curtains open, clearly the thought of a major UK athletics event happening on some people’s doorsteps, made no difference to this sleepy village. However, I do remember that when the village pub opened at 11am the hamlet suddenly woke up!! Team chief, Adrian (@tarittweets) was busy organising and setting up the day as we loafed around waiting for the start of a long hard day. The mood was sombre, maybe Dave’s laid back nature was rubbing off on us. I was nowhere near as nervous or worried as I was in Perth in 2016, an old hat maybe. Team photos, support table set up and we were stripped and heading for the start line, some 500-600m clockwise back up the race route. It was very cold, many had arm warmers on, all had gloves and most had headwear of some description. There was also a fairly stiff northerly wind that only added to the chill factor. We said our good lucks to each other and then I focused on the task. The gun fires and we start running, that first hue exhale of breath makes a large cloud of condensation in the air as Ant, Jez and Mike race off into the lead. They have a twenty second lead by the time we re-enter the village and cross the lap/finish line for the first time. Mike eases off from the leaders and I move away from Grant and David to join him. We run together for some of the first lap when we see Jez popping out of the bushes and joins us. It is clear that Ant is out to run hard and I make an effort to make up the gap to join him. At this point I am not sure if I have done the right thing. Pace was slower than I wanted, but the race had only started. By the end of the first lap Ant and I were running more or less together. Ant it pushing the pace, I decide to ease off and get back to a pace I feel comfortable at, then Ant jumps into the bushes and I take the lead in the race for the next few laps. I create a gap, but it is short lived as I make my one and only toilet stop and Ant catches me not long after that. Marathon distance comes up at roughly 2:53 and we go through 50k together in 3:26. This is hard running and Ant again pushes hard again and opens up a gap. I let this one go as we are approaching the business end of the race and I am started to feel that familiar low level all over pain starting to climb. If it gets to a point where mobility is affected then my race is over. It was time to ease off. Photos courtesy of Robert Gale. A good break in the race report to give my thanks to the support. Mrs T was my support for the race and she performed like a professional. I got exactly what I needed on each lap and she made sure I was ok every single time. There is no doubt that having her there made a huge difference to my race. Even now, after 18 years together, I want to impress her like a love struck teenager. David and Dave had also brought their partners down as support and they all had a fantastic day, despite the cold weather. Also, but not surprisingly, the support from the other team’s support crews was fantastic, encouraging on each lap. Norman, at one point, when Ant had opened up a gap of around 2 minutes, said to me that the race doesn’t start until 80k, and to take it easy and keep him in my sights. I went through 50 miles in 5:32, the early pace was starting to work its way into every tendon and muscle in my legs and I could feel the inevitable slow coming on. It was now time to dig, no it was time to excavate deep into the resources to maintain pace and form. This last 12 miles were going to hurt, I accepted that and started to push. An apt time to bring up nutrition. The only gels I can stomach are Honey Stinger (@honeystinger) and after some monumental mistakes in training I had settled on a plan. When I took a gel (roughly every 3-4 laps) I would take a full lap of 2 miles to consume it, taking pea size blobs every now and again until it was finished. It meant that there was never a huge drop of sugar into my stomach in an attempt to avoid any stomach issues. It worked. Hydration was Active Root (@active_root), who I am now a brand ambassador for, and again I would take sips on the way round a full lap. Again, this worked perfectly. Only once did I refuse taking on any nutrition when I thought my stomach felt a little full. This approach worked a treat. When I started to feel a little cramp coming on, I added apple cider vinegar (or pickle juice) to my drink and again this seemed to keep cramp at bay until the final few laps. There was also flat coke in those final laps where the largest amount of sugar you can get quickly is required. I can’t fault my nutrition this time and I think I have found the right combination of gels and hydration, at least for me I have. At no point did I feel that I couldn’t take any more of the Active Root on, it is such a great taste, refreshing and thirst quenching, every time. As I crossed the lap/finish line Mick McGeogh (look this guy up, a quality runner in his day) announced the time difference between Ant and I. The first time I took notice of this was when it was 1 minute 47 seconds. At this point I wasn’t sure that I would have enough laps left to catch him, especially if he was still pushing the pace. It was time to switch goal. To target goal B. Looking at my watch and attempting to work out the basic arithmetic, I had a chance of running under 7 hours. Let’s be honest here though. Under normal circumstances that arithmetic would be at Carol Vorderman speed, however after 5 and a half hours of hard running that speed gets slowed to the point where I have to resort to using fingers! I come through the lap/finish line again and Adrian and Mrs T tell me the time difference has dropped to 1 minute 30 seconds. Adrian (@tarittweets) is the essence of ultra running. What Adrian doesn’t know about this sport is simple not worth knowing. His faith in me when taking a punt in 2016 and again this year after a long term injury is something I will be eternally grateful for. He has given me chances where I suspect others may not have. He is the best in the business and I can’t thank him enough for the opportunities he has given me. I try to maintain the pace but as soon as I increase effort, cramp starts to appear on my left hamstring. I’d felt this for some laps maybe 5 or 6, a little tightness here, subside, tightness again, then subside. I had maintained a pace that was keeping the cramp at bay, but any increase in pace, any change in running form was triggering it. More apple cider vinegar as I go through the support area, encouragement coming from everyone, Mick announces the time gap is 40 seconds. There are 3 laps to go. As I move onto the first straight of the lap I see Ant. I haven’t seen him for a few laps. We get to the hairpin bend after battling into the wind for the 29th time and I can see he has slowed. I overtake Ant, shouting encouragement for him to stick with me. We had spent most of the day together, pushing each other, jostling for the lead, I wanted him to finish strong. But I open up space between us as I maintain pace. As I approach the support area I don’t take on any hydration, Adrian shouts at me to go for the 7 hours and I dig deeper into the reserves again. Penultimate lap. The only real point to see your pursuer is at that hairpin bend and when I round it I can see Ant about a minute adrift of me and my mind turns to winning the race. My Garmin had gone all funky with the laps and it looked like the sub 7 was off the cards, but the ‘A’ goal was back in play. Win. Everything hurts so much now, every step is agony, my shoulders are hurting, my back hurts, my legs and feet are trashed. I cross the lap line, again to massive cheers and encouragement, I swear there was a thousand people there. I try to keep pace, keep form, keep my head and as I battle through the wind my effort level rises sharply for the last time, or so I thought. I can’t describe the feeling of relief I had, knowing that I did not have to run that section of the loop again. The biting northerly wind in full force in your face for almost half a lap. I round the hairpin for the last time and do the now habitual glance back. And there was Ant. Probably around 20 seconds behind me, he was flying, I could see he was flying, directly into the wind. I took a massive breath in and started to run, run hard. My breathing spiked immediately, I forgot all about the cramps, they didn’t come back, why? 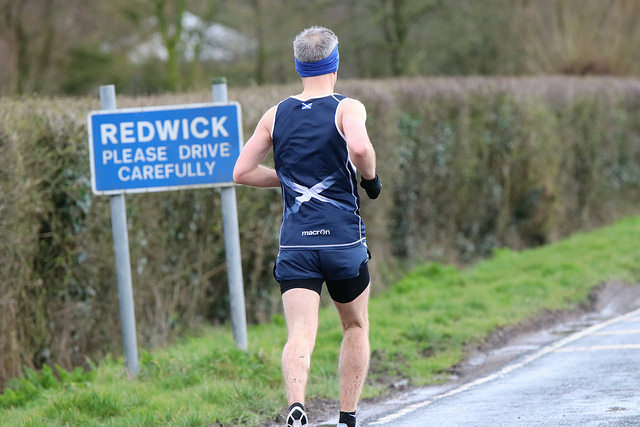 There are two long straights before the village sign, or the relief sign, I can’t describe how good it was to see that Redwick village sign for the last time, no matter what happened in this last 500m I would not need to run past that sign again. I am running fast, garmin would later tell me it was down at the 3:30/km pace, 35 minute 10k pace and Ant is still closing me down, a glance back and I can see the colour of his eyes, this is a fight to the end. As I see the support team I know there is not enough road left to be caught, I am handed a Saltire and I start to ease off while getting the flag over my head, a last minute panic glance back and I can’t see Ant and I cross the finish line in 7:00:30 to take the British 100km Championships. I can’t believe it. Ant crosses the line 7 seconds behind me and we hug, both knowing that we have just ran the hardest race, knowing that we both left everything out there. Mike finishes third in 7:16 for his first 100km with David 4th and Dave 5th. When our cumulative times are announced we learn that Scotland also takes the Anglo Celtic Plate home with us. It’s already out there in the interwebs, but I feel it is necessary to say that I cannot do this support without the unparalleled support that I get from my family. There have been some big sacrifices made in order for me to get my 5-6 hour long runs in at the weekend and all the late returns from work as I run home. I am eternally grateful to have such a supportive family, this simply would not have happened without that. Second, massive thanks must go to my coach Paul (@pyllon). Yes, I complete the training, but I am a robot, I follow the programming that is input into the robot and that is where the talent is, the programming is the talent and Paul has managed to get more out of this aging body than I thought possible. It’s only been 7 months. When he got me, I was pretty unhealthy, a little over weight and doing a bit of running after coming off a long injury lay off. The longest injury lay off I have had, where I did very little exercise. I am extremely motivated to see where we go in the next 12 months and beyond. Lastly, Runderwear. They pulled out all the stops to source a pair of long boxers for me. I have been using their brief under tights all winter without issue and tried to buy a long boxer. Sold out everywhere. A facebook message later and they went above and beyond the call of duty to source a pair for me. They worked a treat and I can report that they do exactly as they claim. Brilliant under garments, you have a new biggest fan!